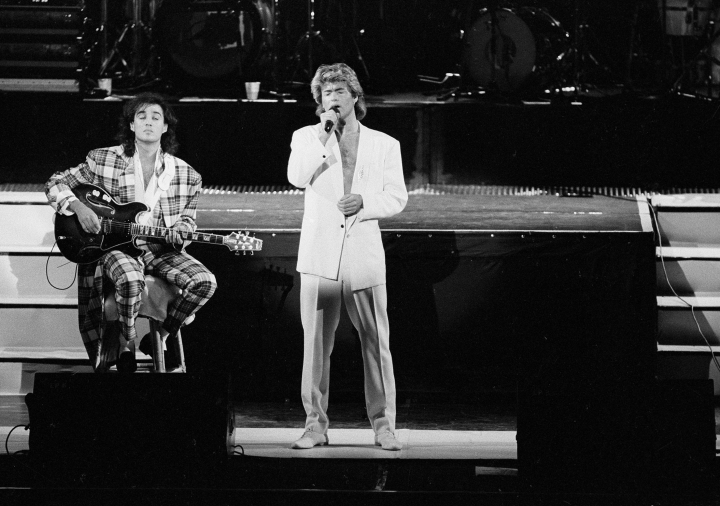 BEIJING — George Michael's death brought back memories in China of the heady 1980s when Wham! was the first major Western band to play in the country after the death of Mao Zedong and decades of cultural isolation. Many Chinese who had never even heard of the band lined up for hours to buy $1.75 tickets to the groundbreaking April 1985 concert at the People's Gymnasium, the biggest stadium in Beijing at the time. Inside the 12,000-strong stadium seated spectators watched in bewilderment as Michael and Andrew Ridgeley danced in big-shouldered jackets with bleached and feathered hair. The backing dancers' strapless costumes and polka-dot miniskirts also stunned the audience in China at a time when people still dressed in similar shades of green and gray. "It was the first time a Western band had come to China, everyone was ready to make some noise and stand," said Li Ji, a restaurant owner who went to the concert in his 20s. "But there were so many police officers there, people didn't dare to." Wham! 's manager Simon Napier-Bell had spent 18 months persuading the Chinese government to let them in and secure their place as one of the world's biggest bands by telling them it would help them attract foreign investment. The police had warned spectators to stay seated, worried that they would be unable to control the crowds and that there might even be riots. Some young Chinese who got up to dance were hauled away by security officers. The Wham! concert influenced Chinese musicians, who had never seen electric guitars played on stage and began to get interested in rock 'n' roll. Huang Wen, a music writer, said that the performance had an impact on big-name musicians, including the godfather of Chinese rock, Cui Jian. "In the early 1980s, pop songs from Hong Kong were very popular in mainland China and after the concert college students and people in the music industry started to get interested in rock 'n' roll," she said. Li said the army department that his parents worked for had given out tickets as a benefit. He attended the concert along with his parents' colleagues and their kids. "I remember there was a little incident during the concert, the main lights went out because there was a problem with the electricity, so the bassist danced a little break dance," Li said. "It was the first time people saw that and it was so popular, people liked it." State media said Monday that the concert "was a sensation." While young Chinese today don't know the names George Michael or Wham!, many instantly recognize his well-loved songs "Last Christmas" and "Careless Whisper." The latter song had already been translated into Chinese and sung in several versions before the 1985 concert. AP researcher Yu Bing in Beijing and news assistant Fu Ting in Shanghai contributed to this report.